This database contains 30 features computed from a digitized image of a fine needle aspirate (FNA) of a breast mass. 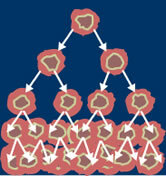 They describe characteristics of the cell nuclei present in the image. The task is to determine if a found tumor is benign or malignant (M = malignant, B = benign). a) radius: mean of distances from center to points on the perimeter. b) texture: standard deviation of gray-scale values. e) smoothness: local variation in radius lengths. g) concavity: severity of concave portions of the contour. h) concave points: number of concave portions of the contour. This is not a native data set from the KEEL project. It has been obtained from the UCI Machine Learning Repository. The original page where the data set can be found is: http://archive.ics.uci.edu/ml/datasets/Breast+Cancer+Wisconsin+%28Diagnostic%29.